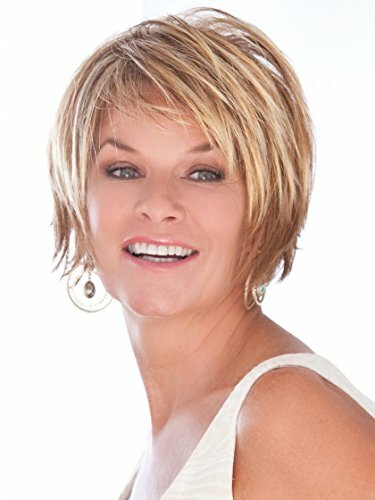 The Trendsetter Synthetic Wig by Toni Brattin features an edgy style and personality with straight razor cut chunky layers for extra flare - definitely for the fashion forward, modern woman. Its custom fit cap easily adjusts to most any head size with the look and feel of healthy, natural hair. Nylon wig cap and storage box included. Hair Style: a fresh, sophisticated style with layers of softly curled hair in the front and sides, and collar-length back. Wear full and tousled or more subdued. Hair Fiber: Modacrylic Synthetic Fiber; Nylon Wig Cap and Storage Box Included. Easy Wear & Easy Care - Just Shampoo Wash and Towel/Air Dry. Do Not Use Hair Dryer, Blow Dryer or Curling Iron & Avoid Exposure to Excessive Heat. Hair Length: Bangs 4", Crown 5.5", Left Side 5", Right Side 5", Back 3", Nape 2"
If you have any questions about this product by Toni Brattin, contact us by completing and submitting the form below. If you are looking for a specif part number, please include it with your message.